You look tired, friend. Come, sit. Let us tell you a story. The world is confusing, no doubt, to a young kit as yourself. Men toil at the hands of other men, who sit smugly upon golden thrones and perceive themselves superior by the crowns upon their heads. Beastfolk as yourself and we run to the edges of the world to escape the grasp of humanity. But it was not always like this. No, once the world was comprised of our majesty, extending from end to end in a glorious array of beasts. A humanless world, and a painless one, much like the oasis you have here stumbled upon. So we will tell you many stories, if you give us the time. Stories of a city filled with splendor, where the richest of our kind gathered to relish in their successes. Stories of the city of thieves, where those of fleet fingers found new callings. Stories of a city taken by power, where the strongest fought against each other in noble combat. But most importantly, young one, stories of a time where we did not live in fear. So have a seat by the fire while we reflect on better days. The world is confusing, no doubt, to a young child as yourself. You toil at the hands of other men, who sit rightfully upon golden thrones and treat you like a beast. But it has always been like this. The world is comprised of their majesty, extending from end to end in a dazzling display of men. A humane world, and a painless one, provided you stand straight and keep in line. So we will tell you many stories. Stories of men who fancied themselves above their rank, and were shown the whip. 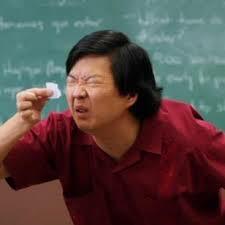 Stories of thieves who took what was rightfully not theirs, and were shown the pit. Stories of rebels, who fought against their rulers and were shown the dogs. But most importantly, young one, stories of men who did not disobey and lived long, content lives. So to your feet, and reflect on your fortune that has brought you this far. Those are some really cool cards, I really love them all. Also, what setting is this inspired from? I'm getting strong Chinese vibes. Back to the zone it came from, its owner's hand. 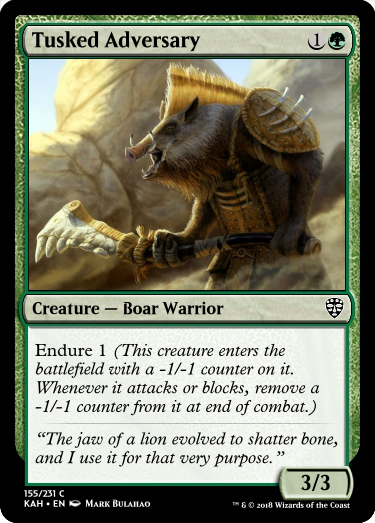 The ancient race of sentient beastfolk on Kahembo are called the Tumbweh, and we do not find them in their happiest age. 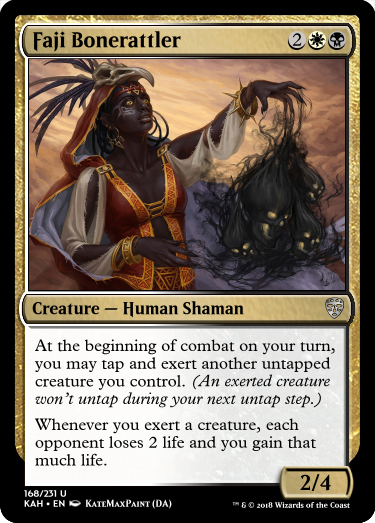 The Amidi witchcraft has driven the Tumbweh out of the lands they previously called their homes, and they now spend their days in one of three ways: Toiling in the Amidi fields as their subservient, reminiscing at the Mekini Oasis, or wandering the dunes in search of a new life. No matter the walk of life, the Tumbweh experience myriad hardships on their journeys, mechanically represented in Kahembo through Endure. 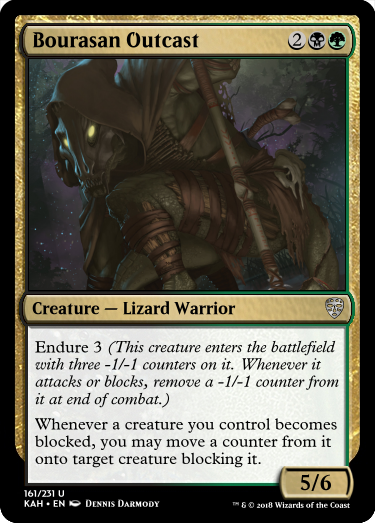 A creature with Endure enters the battlefield with -1/-1 counters on it, and can remove those counters by attacking or blocking, overcoming struggle after struggle on its wayward path. 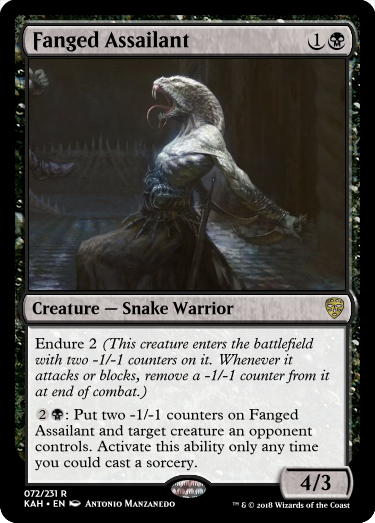 Endure appears on Kahembo in white, black, and green. 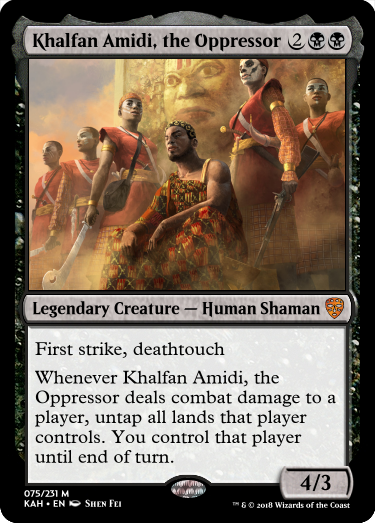 The Amidi control the plane of Kahembo, and they go to great lengths to maintain their power. They have conscripted witch doctors from across the plane to practice their dark arts within the royal palaces, with the understanding that their illicit gains will used in part to keep the Amidi atop their thrones. 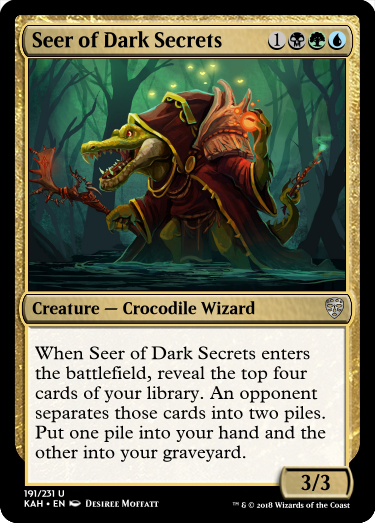 The witch doctors' art uses a vast amount of arcane energy, of which they are not often keen to provide their own. Instead, with explicit permission, they draw from the energy of loyal Amidi subjects. Mechanically, this is represented by exert, returning this time with a twist. Instead of a creature exerting itself, Your creature will happily exert your other untapped creatures in order to achieve its true potential. 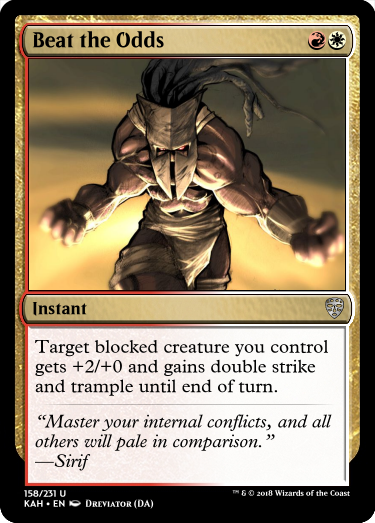 Exert appears on Kahembo in white, black, and red. 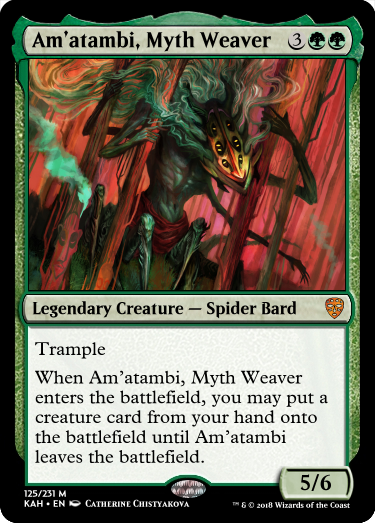 Many stories are told in Kahembo of the days of old, where mythical beasts roamed free and lived in perfect harmony, free from humanity. When these tales are told by experienced storytellers, the beasts seemingly come alive once again, appearing through the raw anima of those very storytellers. This is represented mechanically as Instill. 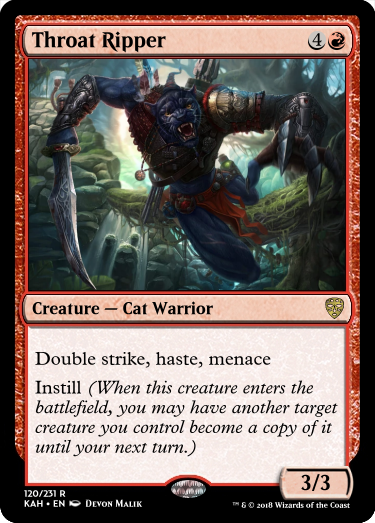 When a creature with Instill enters the battlefield under your control, you may have another creature you control becomes a copy of it until end of turn, ready to exhibit that creature's every characteristic in this chapter of its story. 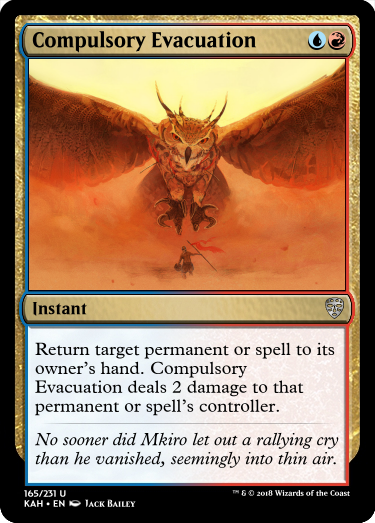 Instill appears on Kahembo in blue, red, and green. 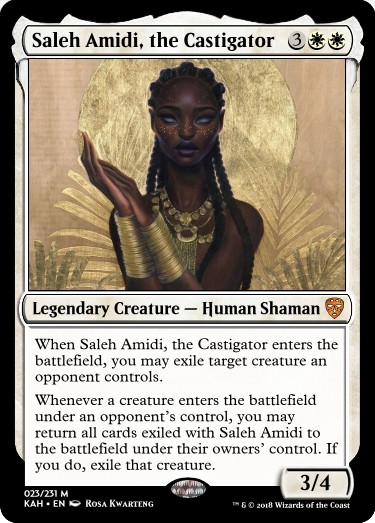 On the outskirts of the Kahembo plains and within its twisted dunes, those men and women scorned but not taken by the Amidi reign gather, planning to one day enact revenge upon the Amidi and rescue their brothers and sisters from its inexcusable tyranny. They wander the hillsides in search of others long among the sands, inviting those others to join them in their pursuits and providing them with safe shelter and a chance at a new life. 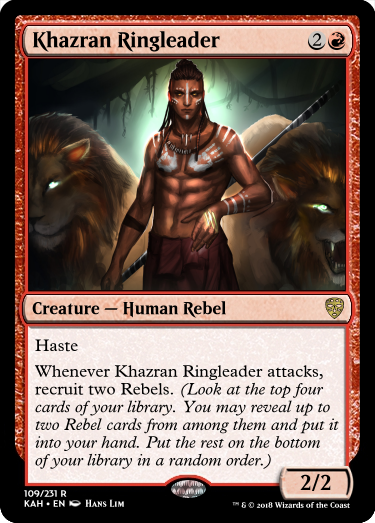 This is represented with the keyword Recruit, which in Kahembo only functions to recruit Rebels, though can be flexed to any creature (or card) type to fit the set. 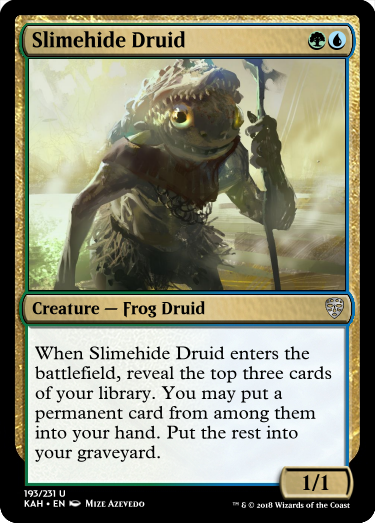 Whenever you recruit, look at the top four cards of your library. 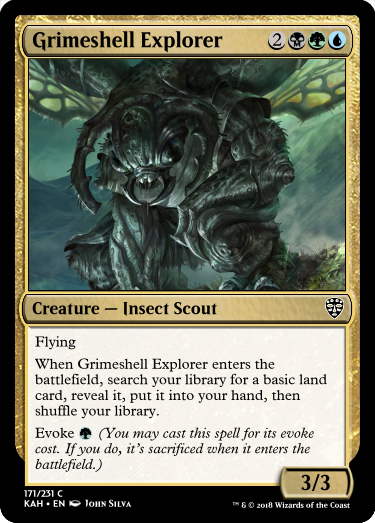 Put a card of the recruited type from among them into your hand and the rest on the bottom of your library, as that card joins your initiative. 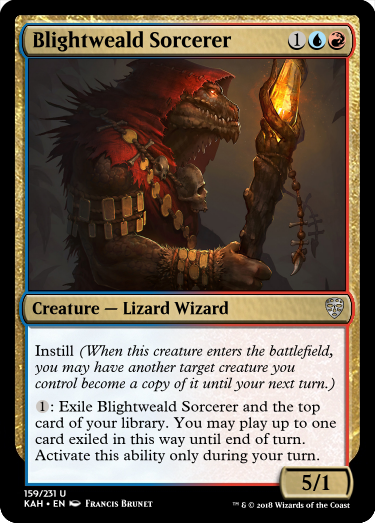 Recruit appears on Kahembo in white, blue, and red. 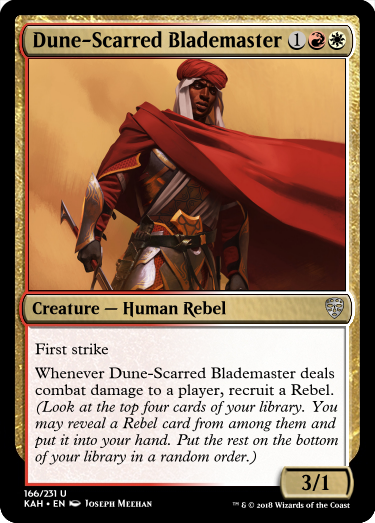 Whether a man broken into pieces by the Amidi reign, a Tumbweh grasping for some sense of its past, or a rebel barely holding on to the chance of a better life, many inhabitants of the sweeping plains of Kahembo pine for better days. They reminisce alone and share stories together, dreaming of a time free from their everyday shackles. 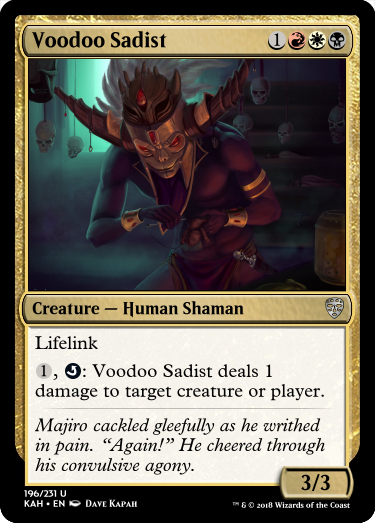 Kahembo returns a second mechanic to represent these hopes, Retrace. 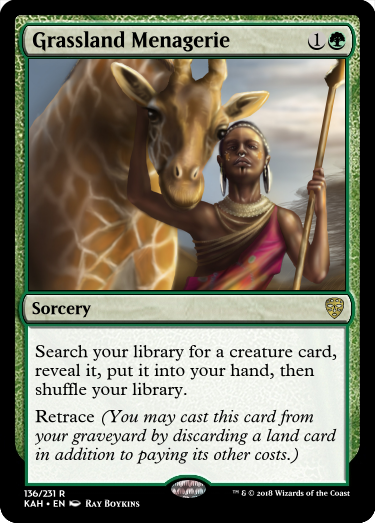 Spells with Retrace can be cast from your graveyard by discarding a land card in addition to paying their costs, and they are flavorfully indicative of a better time, free from the Amidi reign, where the peoples of Kahembo were once before happy. 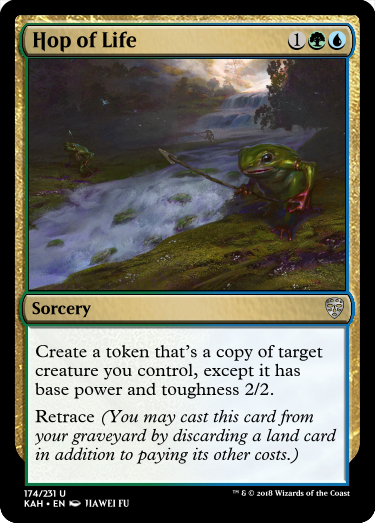 Retrace appears on Kahembo in blue, black, and green. 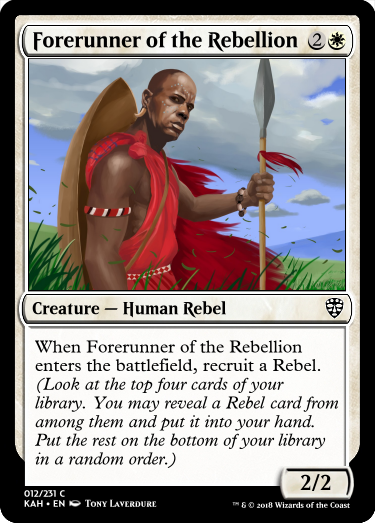 Finally, among the sorcerers, rebels, and beasts, there are many on Kahembo with powers that transcend their corporeal form. 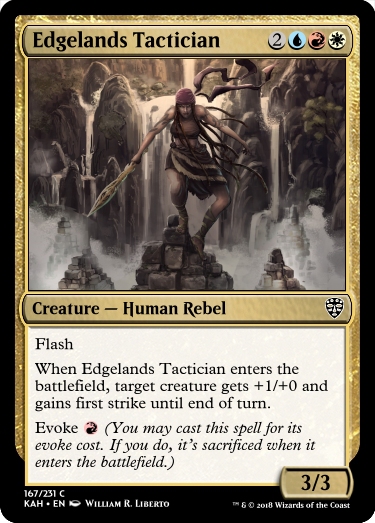 This is displayed through Evoke, our third returning keyword, which allows you to cast creature spells for a reduced cost with the caveat that they will be sacrificed upon entering the battlefield. 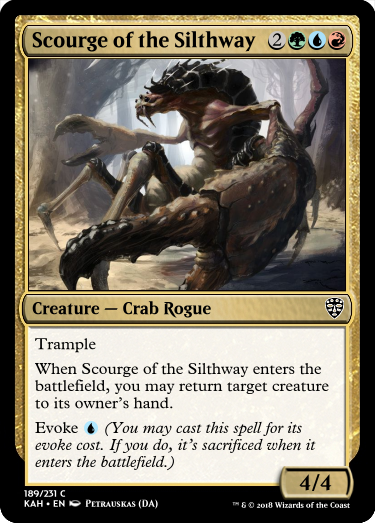 In doing so, these creatures are evoking their powers to aid their allies, even when they can't physically join them in battle. 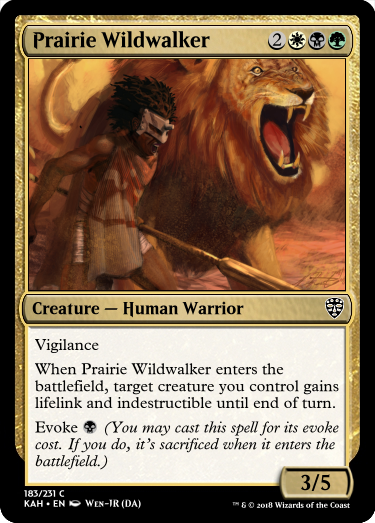 Evoke appears on Kahembo in all colors. Agh, really? That's a nuisance. They display fine on this monitor. Is it all of the cards, or just the row along the bottom? 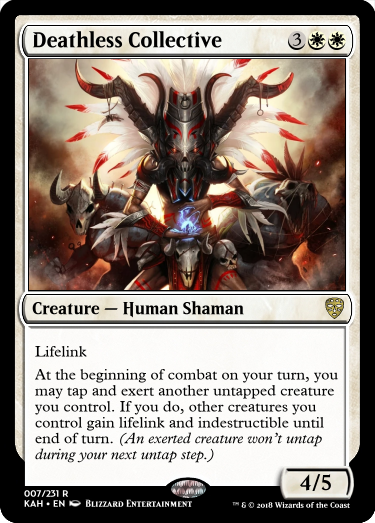 These mechanics look really cool, especially Instill, to which I'd like to see how broad the design space is. 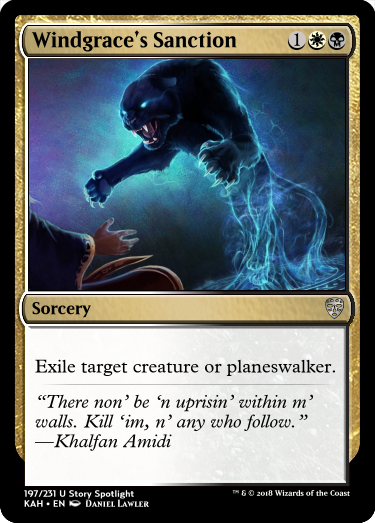 Regarding Endure: If you have an ability that basically wants you to put -1/-1 counters on your own creatures, be careful with cards like Soulstirrer that use these counters as a downside and could lead to awkward situations. The twist on exert, however, is great! 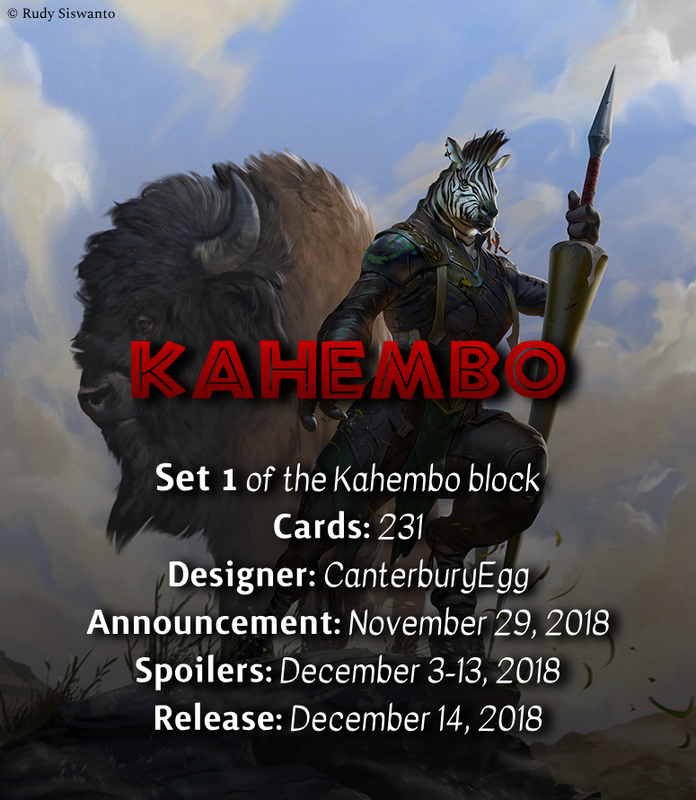 Like all good sets, Kahembo comes packed to the gills with limited designs. Among those designs are 15(!) 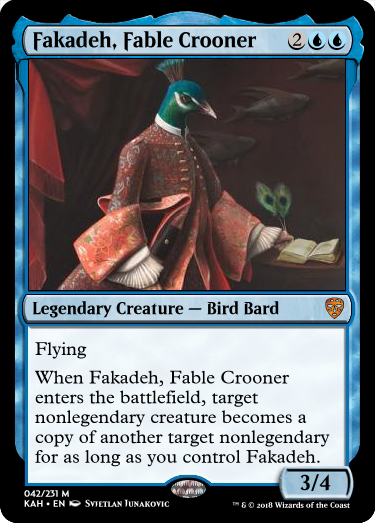 multicolored uncommons designed to enforce the strategies and streamline the power level of their three-colored wedges. 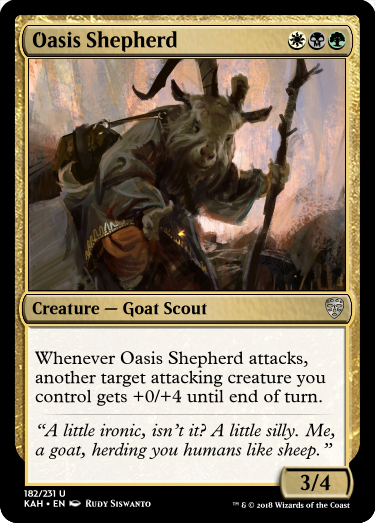 Five of these have already been spoiled in the mechanics post, but the other ten are presented here for your consumption. Enjoy! 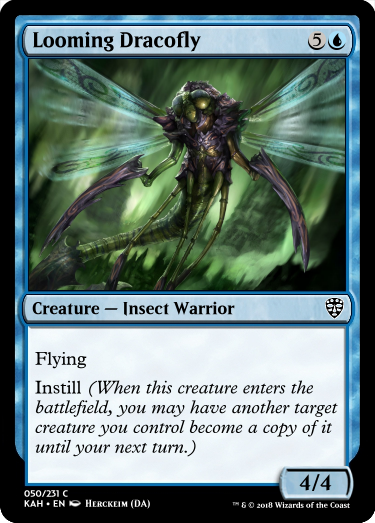 So there's 1.3076744 x 1012 multicolored uncommons? Isn't that a bit excessive? 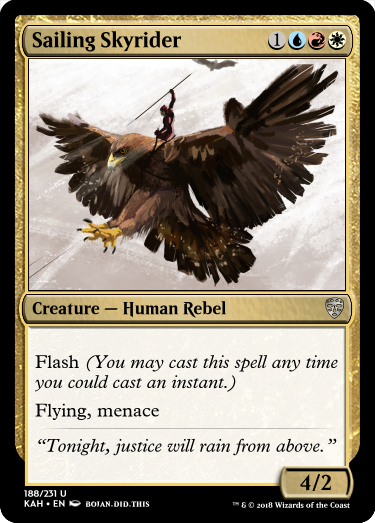 I don't think Windgrace's Sanction counts as an arcun since you'd basically want to autoinclude it in your deck in limited since it's solid removal. 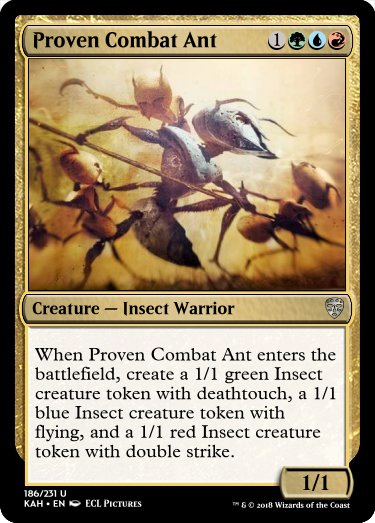 My favorite of the bunch is definitely Proven Combat Ant, name's perfect and I love it's effect. 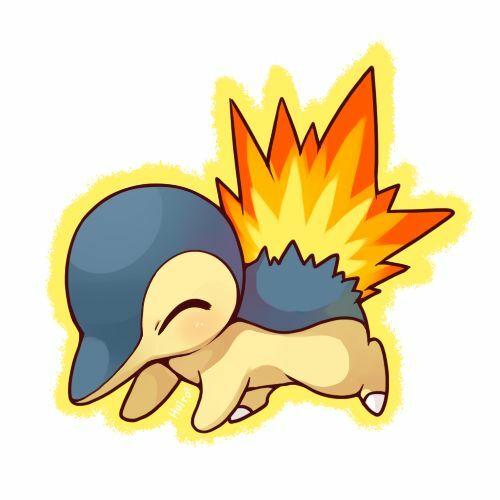 I'm a bit on the fence about returning the untap symbol (funny enough, I used to love it a few years ago XD) but that's just something personal, I think the sadist is cool. Oooh, a setting with an Africa theme! 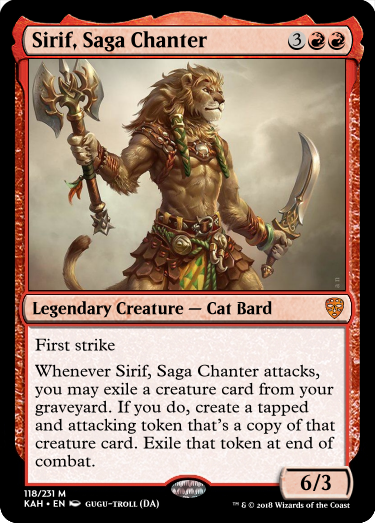 This brings back memories of the days of Mirage and Visions, which was when I started playing MTG for the first time. Yeeeah, that aspect is kind of... iffy. You could see it as having unfortunate implications, particularly from an American point of view, given all the history behind it. On the other hand, slavery has historically existed for a fairly long time in many parts of Afrika. I would say tread carefully, but so far, I haven't seen anything I would consider problematic though - at least from an outsider's perspective. Also, I really like the designs and the flavor so far. Slavery has historically existed in almost every culture. 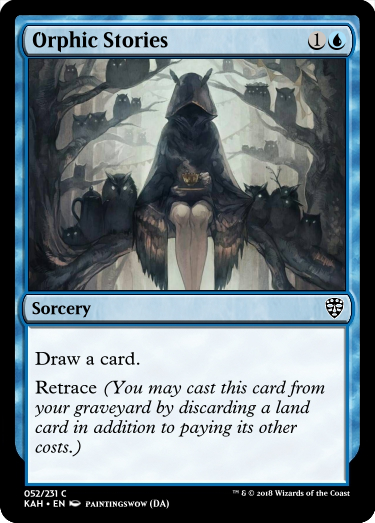 This wouldn't even be the first time slavery has been depicted in Magic. So I don't think there's really anything wrong with the concept being here. A story needs a central conflict. An oppressive, tyrannical system taking over is a pretty classic conflict, and people being forced into servitude is a part of that oppression. As I said, I don't think the premise is in and of itself problematic, and so far, I haven't seen any issue with the specifics either. 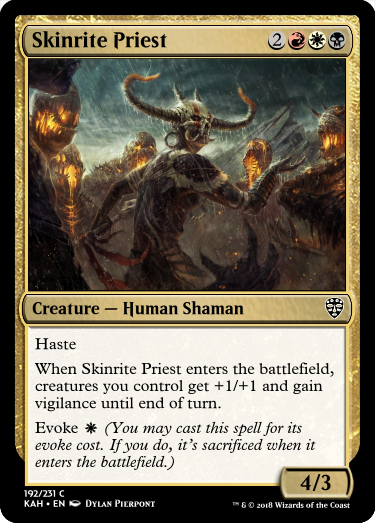 That said... it feels a bit weird to see Evoke pop up on cards that aren't Elementals, but I love that mechanic. Nice to see it in the set.